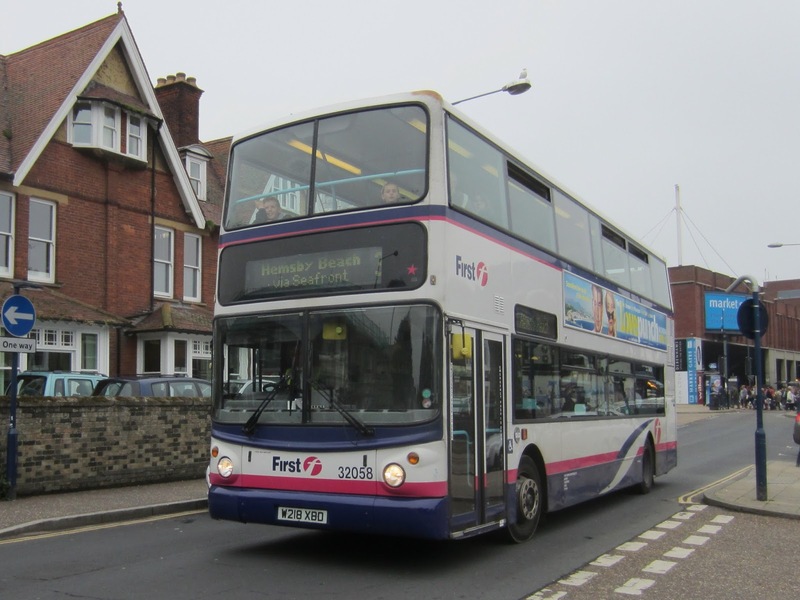 Since 32059 has returned from repaint into GYT livery it has normally been found working the 8 service, last week it ventured to Lowestoft on the 1's and today i noticed it at Yarmouth Rail Station waiting for passengers on the 3 service. I thought i would venture through to Hemsby to get some shots at the Beach Road terminus but those plans went up in smoke (literally!) as a rather large fire had broken out opposite! 'Having looked at your blog ,it jogged the ole brain box on George Ewer. Personally I wasn't a follower until, like all things, they pulled out of coming our way on the Yarmouth to London service via Ipswich. I could kick myself, if i was double jointed, all those superb Leylands & tired ole Bedfords that tried to keep to time as they pulled into St Margaret's Green Ewer depot over the years My loss entirely. 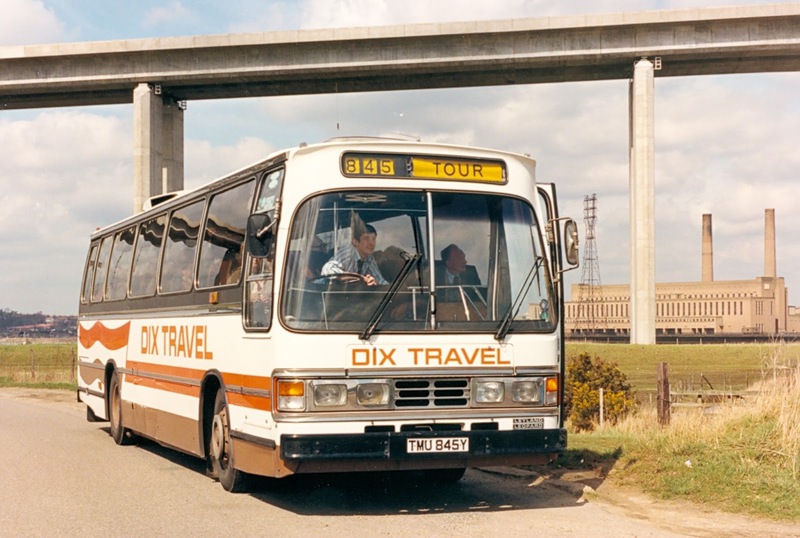 I did take two pix, the first was of TWU845Y with Dix Travel which is in your blog photo. Looking at where I took her, I gather she was off route slightly in order to take in the Orwell bridge & it's river settings. Behind her is the old coaled fired Ipswich power station, long gone now. The photo was taken in the late 80's or early 90's. Upon entering the display area I enquired how many attended - sixty was the reply but many have already left for home! 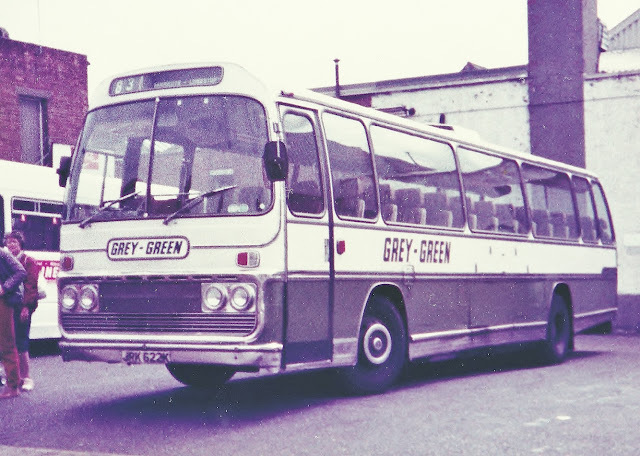 The first of these was ABO 145B an AEC Reliance /Harrington Grenadier new to Western Welsh in February 1964 as their 145. Seaford and District was showing UUF 329 J - "Brighton Belle" a 1971 Leyland PSU3BR/4R Leopard with Plaxton Elite luxury touring bodywork. The coach has only 28 luxurious seats and would normally accommodate 53 people. 'Brighton Belle' was operated by the former Southdown Motor Services of Brighton, and is in "Pullman" chocolate and cream livery. 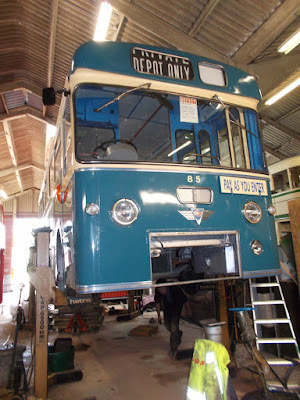 Another AEC product on view was that of former East Kent WFN513. Shown in that livery it is a 1961 built Reliance 470 with Park Royal 41 seater dual purpose bodywork. 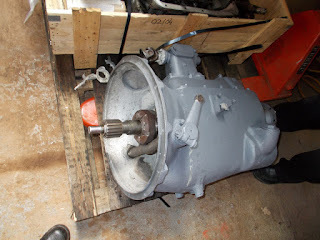 Last but not least is this 1940 Austin K2 registered FYY413, complete with trafficator ears. 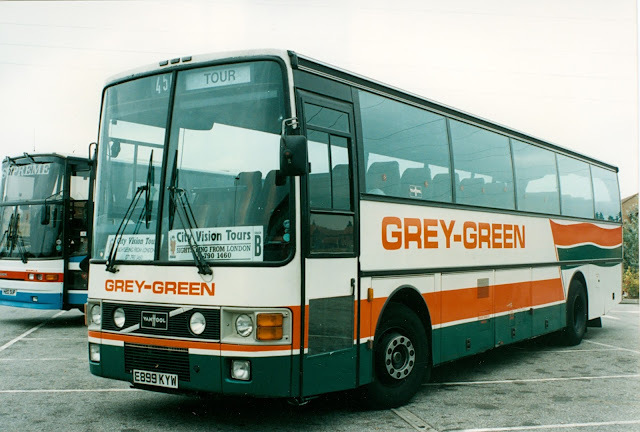 Whilst in London Transport green, it was never owned by London Transport. Apologies for the poor quality photo as, by then, the rain was getting the better of the camera and me! I hope you enjoyed this photo special and let's hope that next year we are blessed with better weather and that I don't get soaked to the skin! 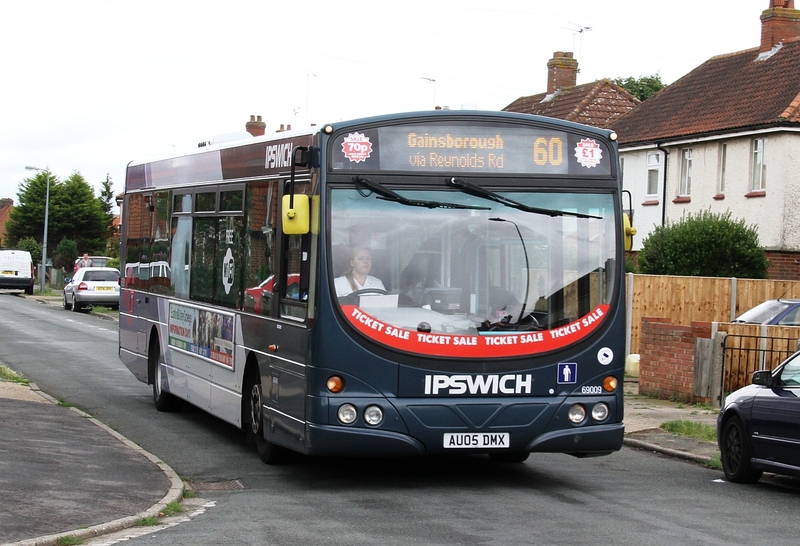 Today saw the start of a Ticket Sale in Ipswich for First's Town Services. 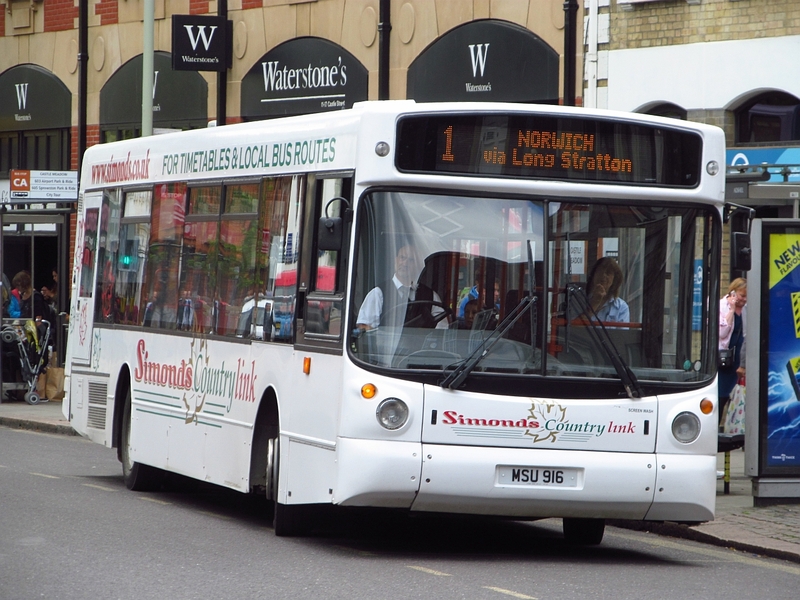 Routes 53, 60, 61 & 61A are now offering Adult Single Journeys at £1 with Child Singles at just 70p. Vehicles are carrying new branding for the sale as well as programmed Destination screens showing the prices on offer to travel. 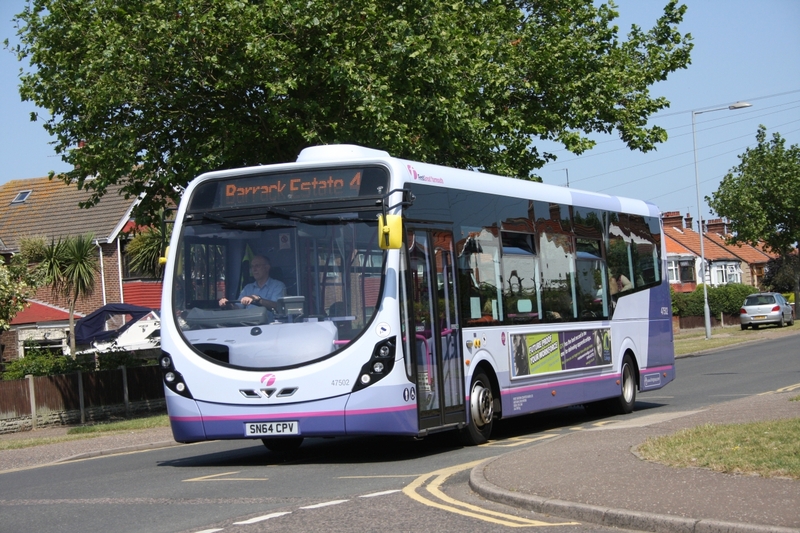 Volvo B7RLE 69009 now with the new branding in Boyton Road today. Many Thanks to Jim Long for the Info and Photo. Former Ipswich B7RLE 66977 KX05MHA was on my list and it was duly captured working the 37 in Castle Meadow with its new Purple front. 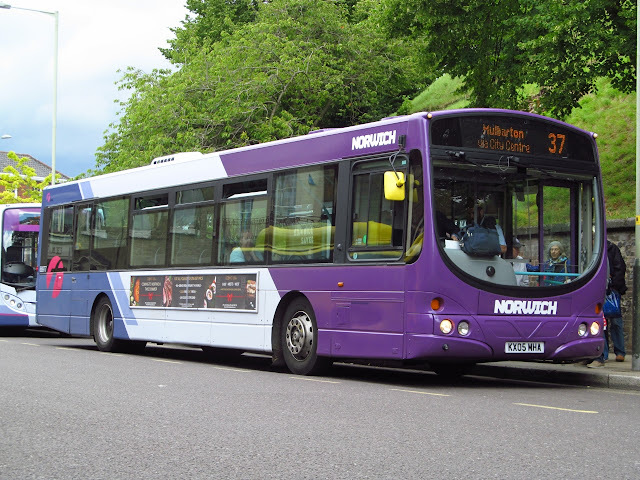 All recent repaints were noted out and about including the controversial 42921 EU05AUN which caused some raised eyebrows regarding its repaint as it was done in house rather than by a contractor and the style of it, it was working the 29A today. 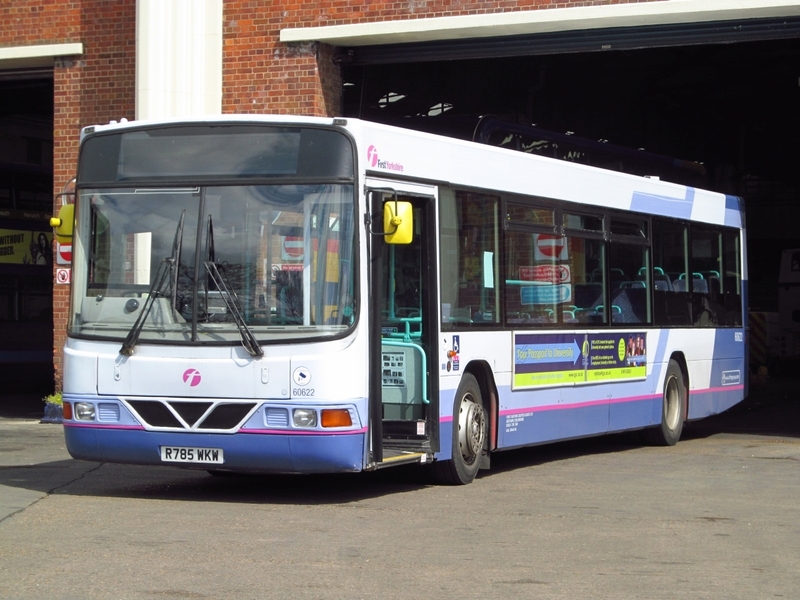 Both South Yorkshire loanee Volvo B10BLE's that came via Yarmouth, 60818 & 60622 were noted in use, 60818 on the 29A whilst 60622 was on the 22's. 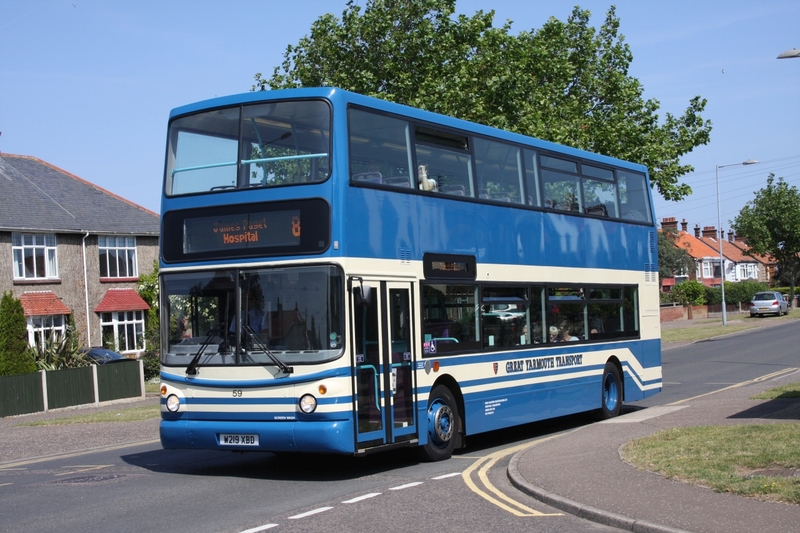 An unusual sight today was Simonds using Alexander ALX300 bodied Dart MSU916 on their 1 service, I know it has appeared on the route previously but nevertheless a break from the normal vehicles seen. 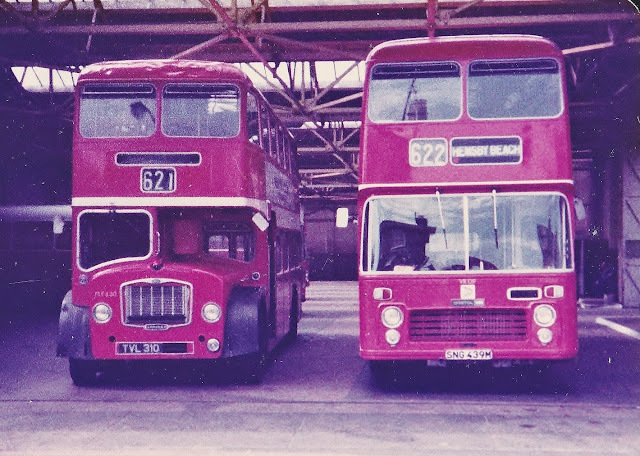 MSU916 was originally registered R239KRG, new to Stagecoach Busways, the batch then passed to Ensign from where it was purchased by Simonds. ALX300 bodied MSU916 heads out of Castle Meadow. 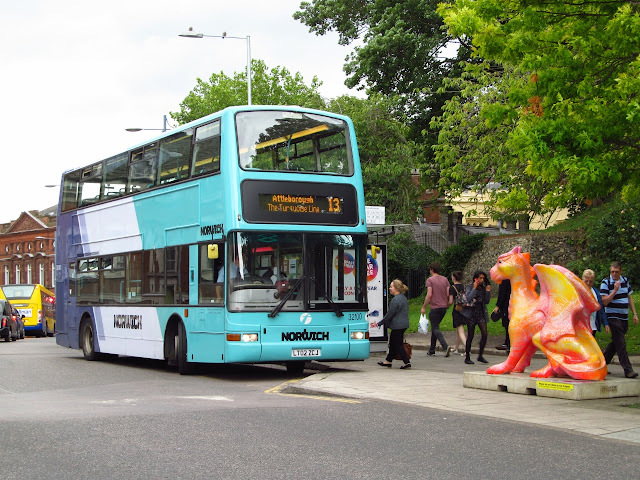 Refurbished 32100 sits alongside one of the Go Dragons on Castle Meadow. Too many photos to post on the blog so i will be uploading more to my Flickr site in due course. 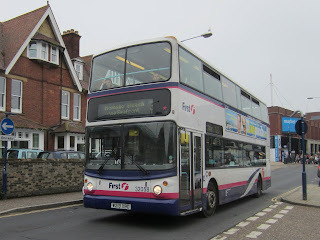 Many of my lunch time breaks from work often found me at either Eastern Counties Wellington Road or at Beach Coach Station. Or sometimes both! 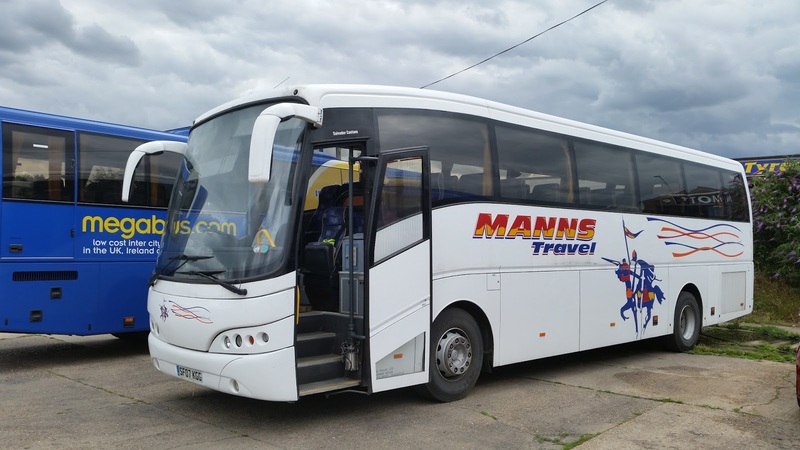 The coach acquired is Caetano bodied Volvo B12B SF07KGG from Manns Travel of Gravesend in Kent. It was new to Malcolm of Dysart in June 2007 and has also seen use with Ashalls Coaches of Gorton. I then adjourned to Market Gates to observe early morning activity there and noted one Volvo Olympian in service in the shape of 34108 W435CWX on the 8 to the James Paget Hospital Unfortunately the photography challenges of the bus station got the better of me, although I did get another photo after it departed but with too many people walking in front of the camera! Another quick update regarding First, Volvo B7TL 32062 W422SRP has returned from Rotherham this afternoon refurbished, meaning all of Yarmouths ex Leicester ALX400 vehicles are now in the new livery. 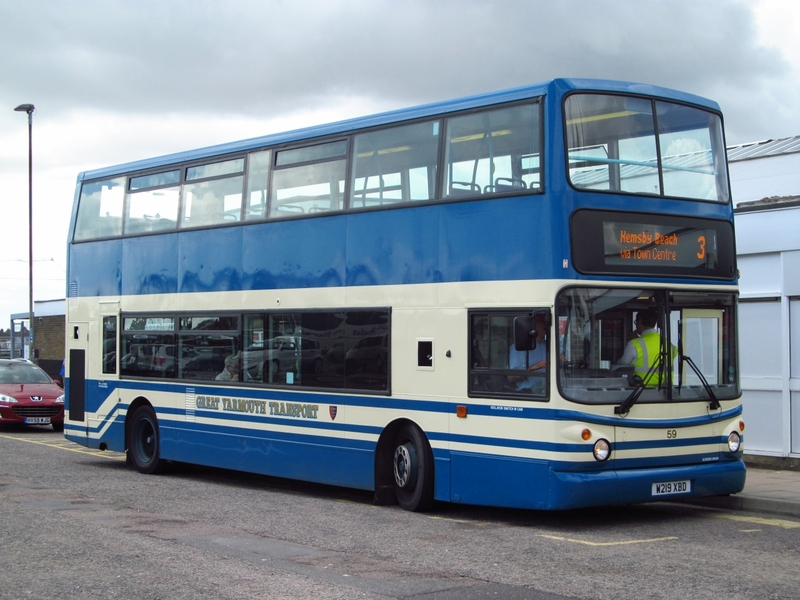 Volvo B10BLE 60622 R785WKW is moving up to Norwich to cover the refurbishments there joining sister 60618 which moved last month. 60622 pictured outside Caister Road last month. 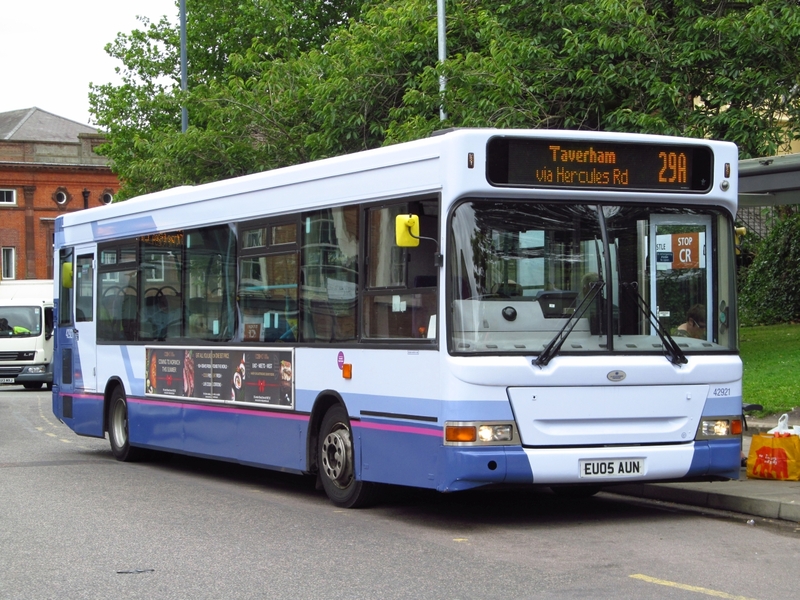 Former Yarmouth Volvo/President 32201 has now gone up to Rotherham for refurbishment joining 33152/33167 & 32203 from Norwich at Midland Road. 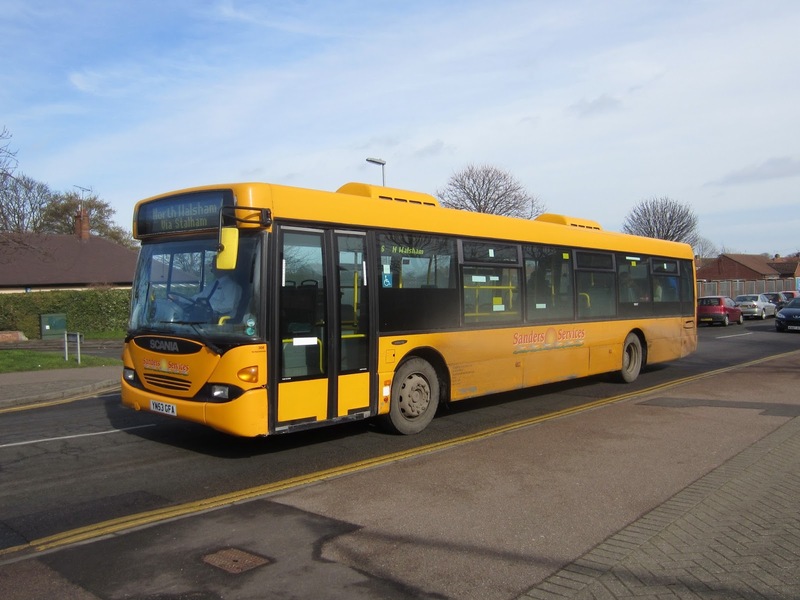 Driver Trainer 60808 has been at Caister Road the past couple of days also. Finally, 32059 drifted onto the 1's yesterday from its usual 8 duties which it has been on since returning in GYT colours. Meanwhile, getting a head start from Market Gates was the National Express 308 service with Ambassador Travel's Scania K340/ Caetano Levante FJ09DXA in charge. The 308 departs almost an hour earlier at 08:35. I caught up with the LL earlier this afternoon parked up outside the village hall and playing field in between runs. Despite trying to eat his lunch, owner Patrick Burnside, and his conductor for the day John Laycock, still managed time for a chat! I would certainly agree Pat and thanks for sparing your time and hope you didn't end up with indigestion! Today's Megabus on the M37 Cardiff working starting from Great Yarmouth was Scania K340/Caetano Levante FJ08KOE. A few things to report from First to round the week off. 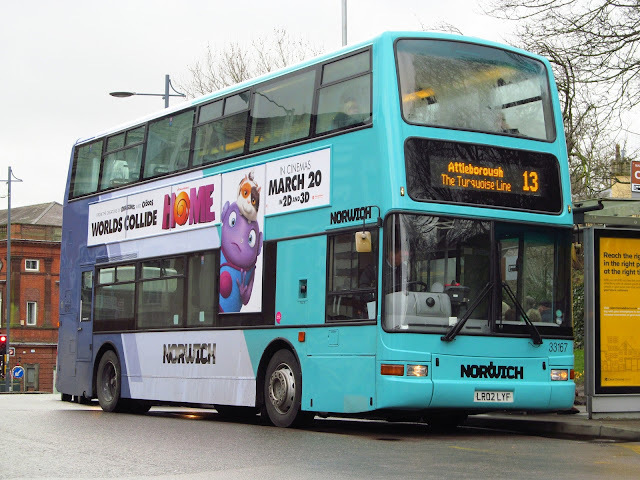 Rotherham moves this week include 32100 LT02ZCJ returning to Norwich after seating tests and sister Turquoise line vehicle 33167 LR02LYF has headed North in its place. 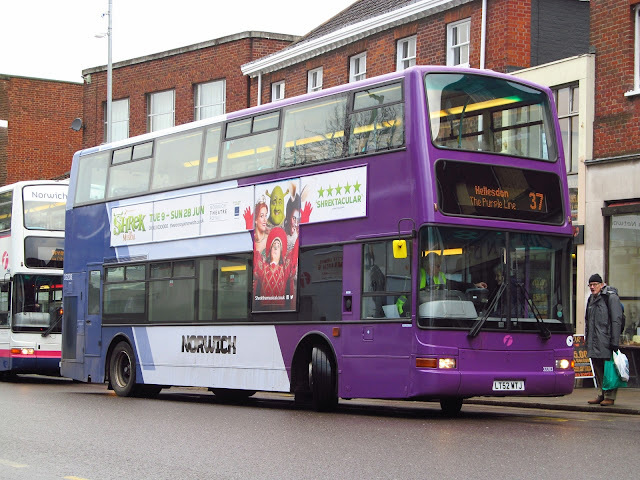 Also currently at Midland Road are 32203 LT52WTJ for internal refurb and 33152 LR02LXL for refurb and repaint into the new Purple line livery. After a brief conversation with Chris Speed yesterday i was informed that the current Route coloured repaints will now have the rear painted back into the standard livery as the Ipswich vehicles were treated meaning they will lose the coloured centre stripe. Rounding up the Rotherham situation, 20514 remains there having internal refurbishment whilst 30888 is being transformed into Lowestoft Corporation Heritage colours. Back here and Alpha Recovery have collected Olympian 34156 from Gorleston Fire Station and Dart 43481(R481DPW) from Lowestoft both for scrap. 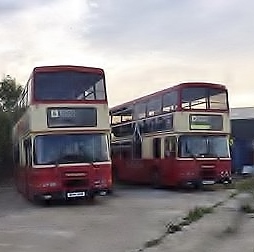 Olympians 34186 & 34109 are both now confirmed as Reserve/Withdrawn at Yarmouth. TVL310 was new to Lincolnshire Road Car Company in July 1962 as their 2509. 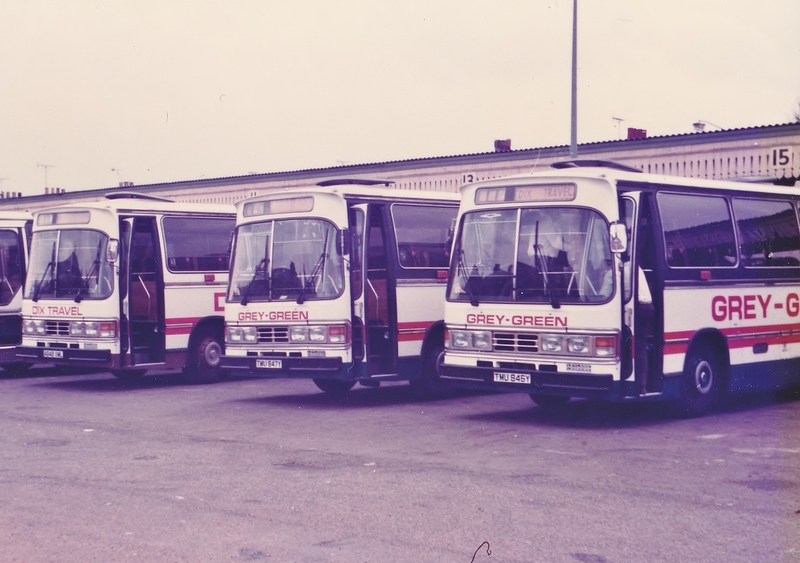 After Eastern Counties ownership, it was exported to the USA where it is recorded as being with Porter of Burnsville in Minnesota in March 1983. Service 3 from Hemsby Beach to Vauxhall via Newport, Scratby, Caister, Seashore, Great Yarmouth town centre and Rail Station will be increased in frequency to every 30 minutes seven days a week. The change comes into effect from Sunday 26th July and lasts until Saturday 29th August. Services 1/1A from Lowestoft to Martham via Great Yarmouth's Market Gates will have a temporary timetable for the summer holiday period to aid punctuality. 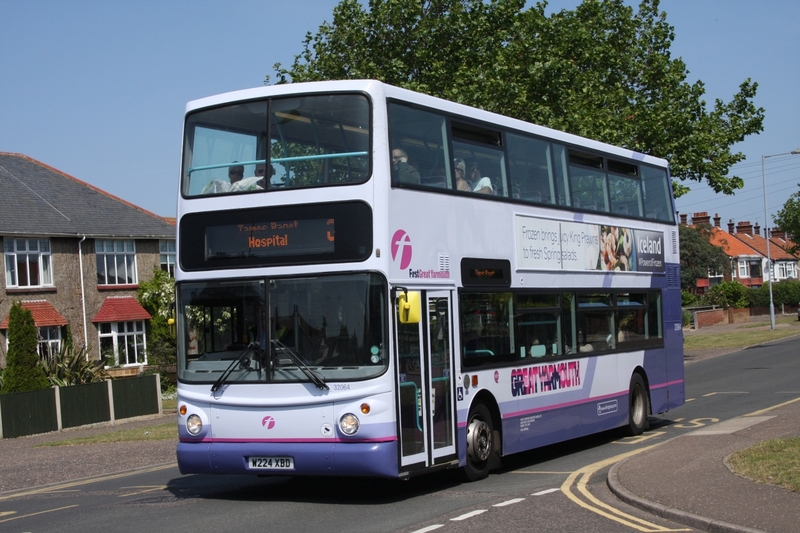 A new timetable provides details but essentially the service still operates every 30 minutes with buses leaving Lowestoft earlier than normal. 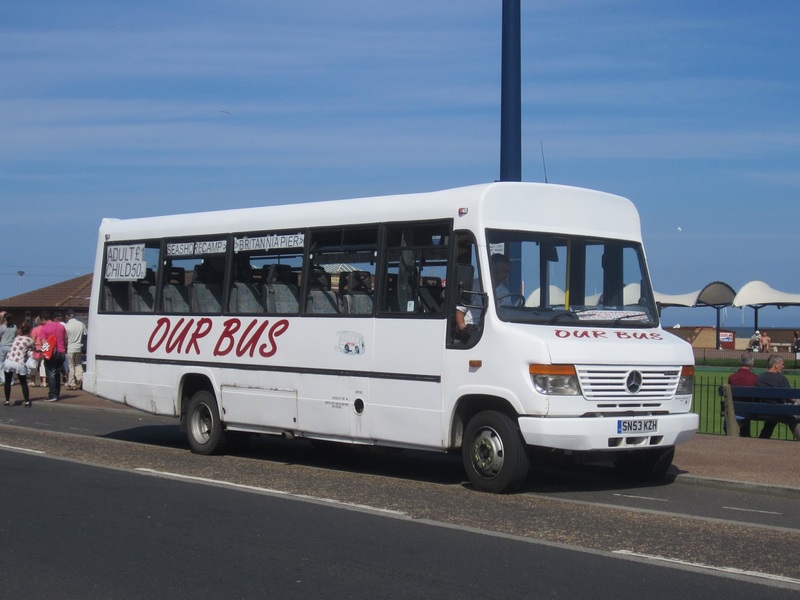 In addition the 2100 service 1 journey from Great Yarmouth is diverted to serve Scratby seven days a week. Had a morning around my local haunts when growing up in Yarmouth around the Newtown area taking the opportunity to Photograph newly repainted 32059 and also a couple of other recent repaints. 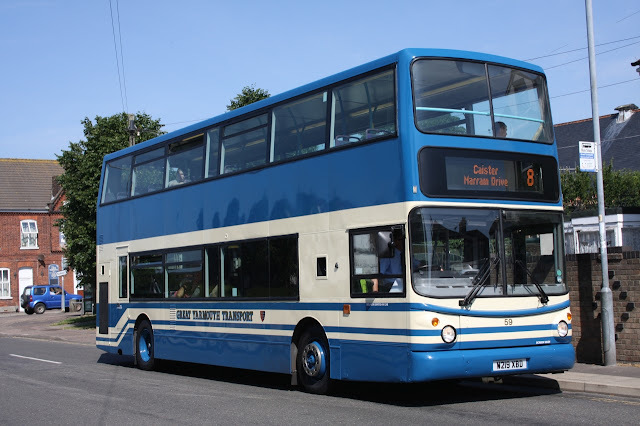 I stuck to the route of the 8 and managed to get some nice shots of the latest Blue Bus to return to Caister Road, first stop was Beaconsfield Road where the sun was in the right place to show off the new paintwork. 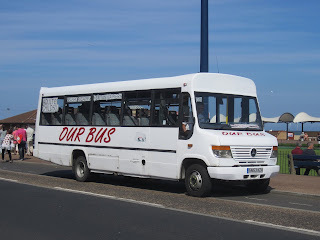 I moved up towards the Racecourse and waited for 59 to return from Caister to get some shots of her heading back into town along Beatty Road which i walked along to School at North Denes (A few years ago now! ), whilst i waited another recent repaint, 32064 was on the car line in front so she was duly ticked off my wanted list, 32065 was also noted.